Investment advising isn’t anything new. Obviously, people who are involved in this kind of business, investment advisors, are professionals with a vast experience in investments and finance. Normally, they run brick and mortar companies where customers can come, sign a contract and get advice on when, where and how to better invest their money. 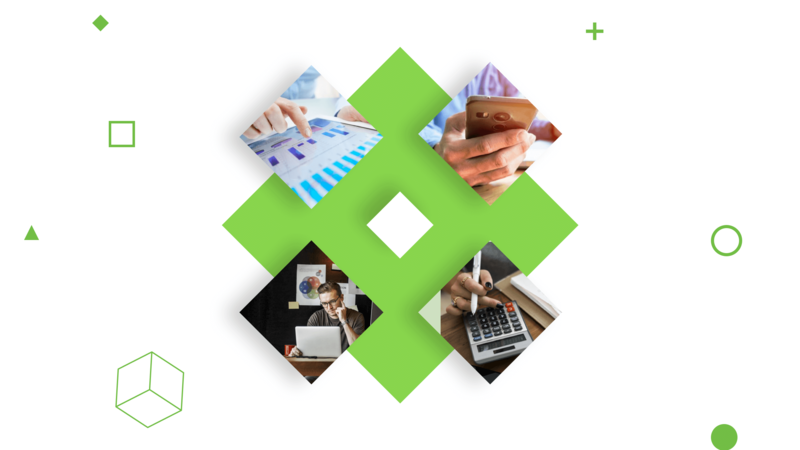 With the technology evolving and growing, what used to be done in offices, companies now want to move to the online world through web and/or mobile applications. With so many aspects of our lives already being digitised, it’s no surprise that investment companies are shifting their focus to online investment platform development as well. Moreover, this trend is global and totally fits into dramatic growth of fintech in general. Only in U.K. Statista notes the following growth of online banking and others services. Growth of online banking and other financial operations in U.K.
Easy access to investments through wealth management platforms would take companies and the way they interact with customers to another level. For users, it would make access to investment advising easier and quicker. Of course, they’re not entirely autonomous – it’s still the advisors who advise and analyze, but the process is way faster than it used to be. What Countries Are Ready for Online Investing? Countries with the most active development of the online advising are those where investments are easily accessible to a wide audience, basically when there’s no minimum investment set or this threshold is reachable for an average person. For instance, in the US, there are numerous options for individual investors to buy stocks starting with online buying and ending up with investment clubs and hedge funds. This results in 54 millions of active individual investors according to Forbes. 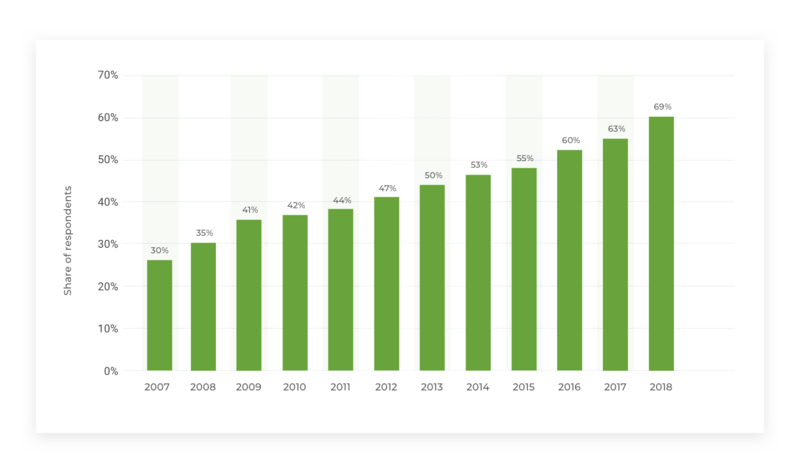 To put it short, online investments are on the rise. However, even though online stock trading is the most convenient, it doesn’t come with advice on where to invest and how much. While the US are already used to investing here and there, a lot of other countries are still on their way to an investment market like this. At the same time, there are a few other countries other than US that have loyal legislation for fintech products. In other words, it’s important to get a clear view of the situation on the market that the company is going to work with because otherwise, the platform won’t pay off. In this article, we’ll give our advice on what to consider at every development stage, based on our experience of development online investment platform that unites online stock trading and advising. Generally, all investment platforms have a similar build. 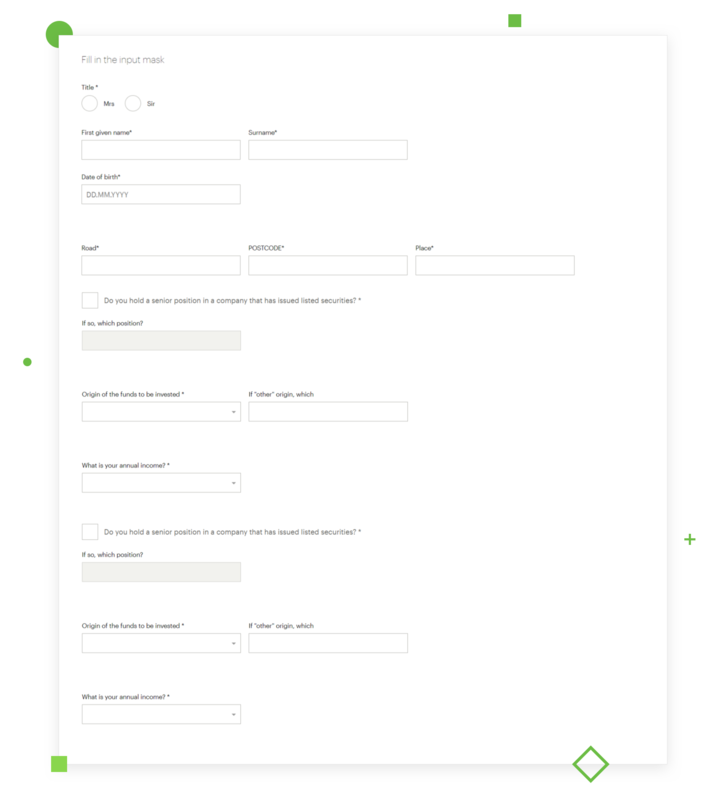 A customers open the website, register and fill in their information. Further on, users have to go through the following steps. Based on this data, the service determines asset classes and markets that are most appropriate for the customer to invest, be it real estate, materials, or something else. 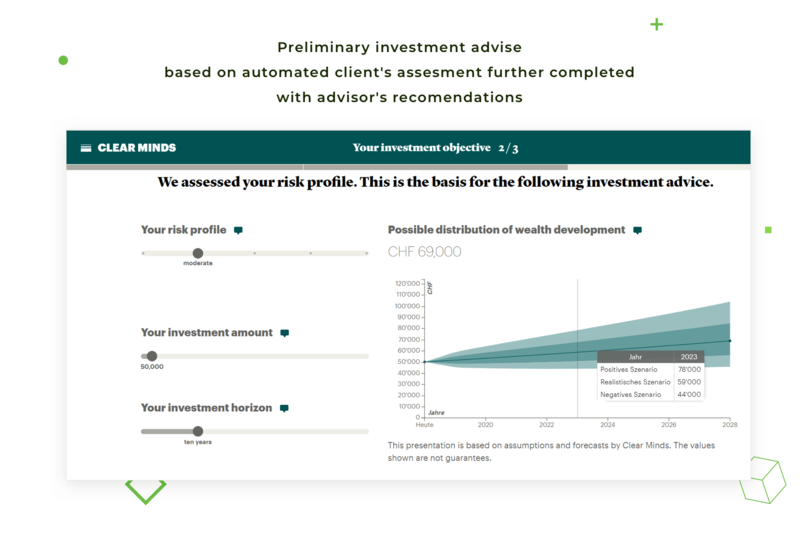 When the choice is made, the system regularly conducts health checks of the customer’s investment portfolio by matching investment results with the set goals. Based on this, the customer gets suggestions on whether it’s profitable to keep investing or if it’s better to pull out and wait. As said earlier, you have to be clear about who your target audience is and whether the platform will be B2B or B2C. It’s important because the architecture of the service depends on it – with B2B, it’s going to be a bit more branched out and complicated. Our task was to develop an investment service, Clear Minds, a B2C-oriented platform, so this is what we’ll talk about. We will cover the most important elements of the platform and its peculiarities that need to be taken into account. When clients come to you, they don’t always know who the end user will be, businesses or individuals. It may happen that you’ll be forced to build the architecture part by little part. The parts that turn out unusable later on, will have to be refactored. 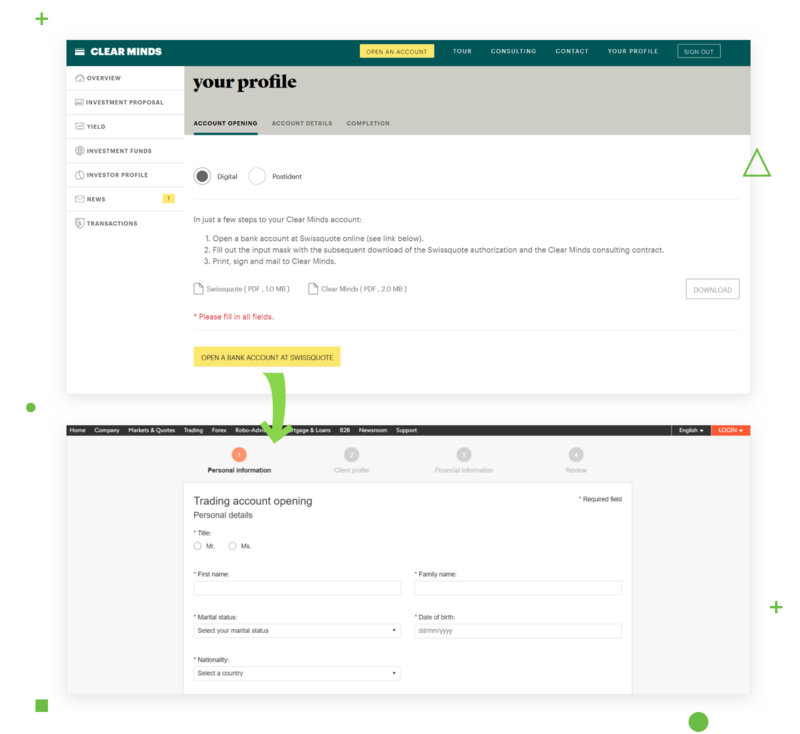 It’s doable, but there’s one drawback – while changing one element, you risk to affect another one that shouldn’t be changed. This is why first and foremost, before creating a funding platform, you have to find out who your target audience is. 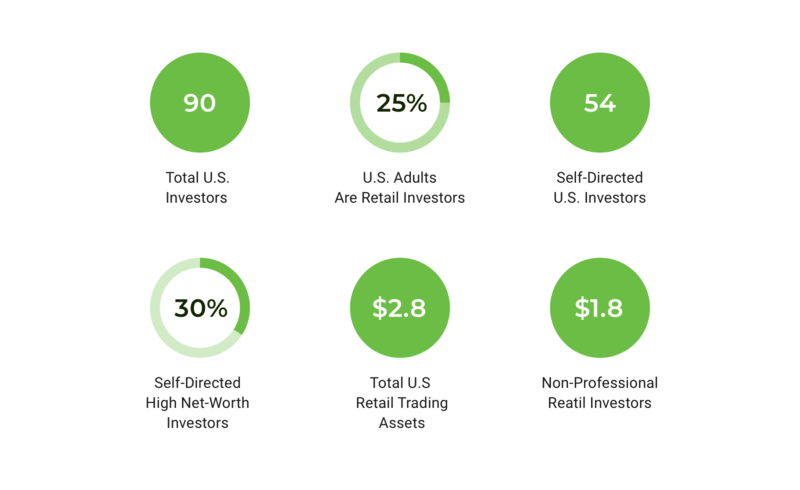 The platform, however, still needs a human touch – it’s being operated by advisors. Each of them has an administrator panel through which they communicate with their customers. For instance, they can update investment funds lists, depending on the suggestions their customer had gotten based on his information. Through the panel, it’s possible to do risk assessment, as well as calculate a customer’s score based on income, credit history, etc., and determine what’s the best way to invest and if it’s worth it at all. In order to obtain financial information about new customers, the platform should have arrangements with banks. A customer registers and fills in the information, which is then being sent to the bank. In response, the bank provides the customer’s credit score, reliability, etc. 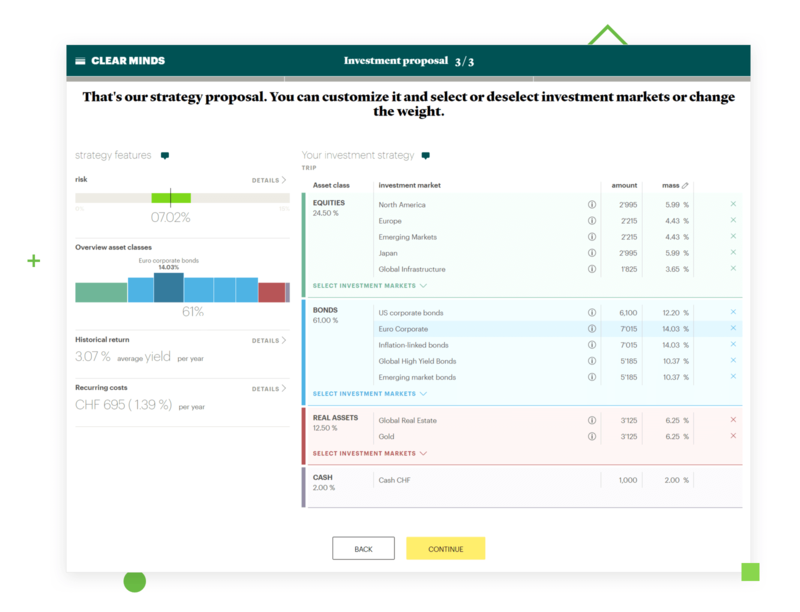 Based on the data, every user gets a score which serves as grounds for investment suggestions. Another important reason for a secure bank integration is the exchange rates integration into the service. 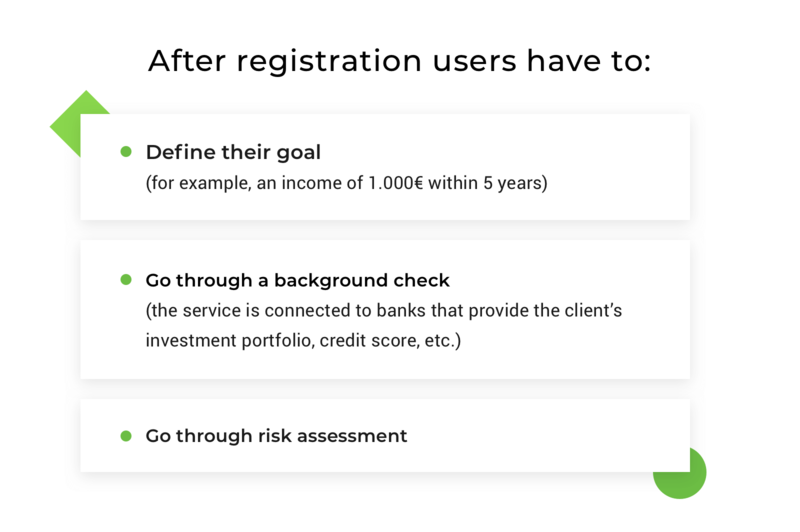 At this point, you need to decide how many banks you want to connect with, as the architecture largely depends on it too. You have to take into account the country in which the integrated banks are located. Obviously, the laws and regulations may vary, as do operating hours. For instance, in England, banks would only provide information during working hours, i.e. Monday to Friday from 9am to 6pm. If, like us, you happen to encounter this problem, you can make these inconveniences seem invisible to the users. It’s not like it’s possible to “close” the app for the weekend, which is why on these days, the data will be extracted from the most recent updates. If a customer makes an investment inquiry on a Saturday, he will get the investment rates from Friday, even though on Saturday it may be different. Technically, third party integration is vital to have proper code error logging, as well as to be able to see what caused errors and how to prevent them. Once we had a case when the third party API format changed, and transactions weren’t going through anymore, but it wasn’t clear what the actual problem was because errors weren’t shown as they should have been. This inspired the creation of a tool for error logging that would log our every inquiry to the third party, as well as their response to us. If an error arose, it would be shown in the log list. 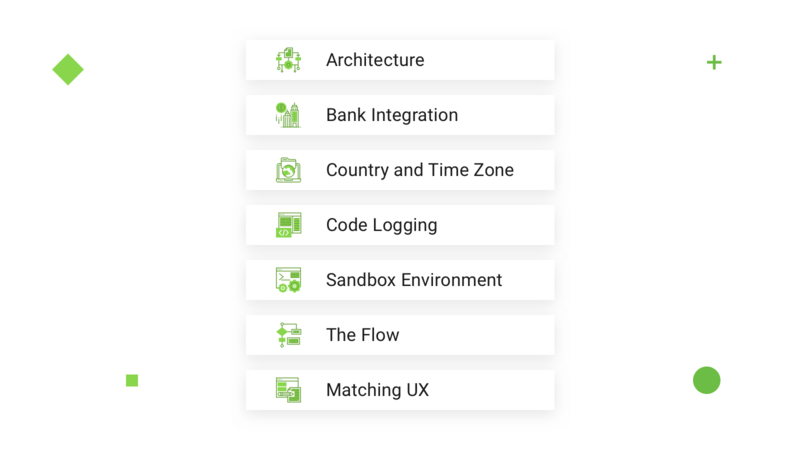 When choosing a third party, a bank, make sure they have a sandbox option for safe code development. This will help to avoid accidental user info corruption or unwanted charges in case of bank integration and usage of their information. A sandbox environment is an exact copy of the third party function set that is being connected to the developed code without risking customer data. When you’re done coding, you simply replace the sandbox URL with a real one, and that’s it, you’re ready to go. How does the customer see your service from his perspective? You have to carefully plan the way your platform will interact with your customer; which steps does he have to take to get results? Registration, background check, choice of market, and the investment itself. Here, you have to leave some space for, let’s call it a getaway, in case the money doesn’t go through or the investment doesn’t take place for some reason on the same day. However, the next day’s exchange rates are different, which will end in a different investment outcome. In our case, we found a pretty easy solution – restricted usage of the investment portfolio. This means that a certain amount of client’s assets remains available at all times, in case of exchange rate changes or transfer fees. On top of it, the service interacts with the customers through notifications. Thus, they don’t have to check the website or the app all the time to check the stock market status. If there’s a good opportunity to sell or buy something, the app will send a notification. First and foremost, you have to keep in mind that all the information like statistics and summaries are shown in large table sheets, which is what you have to take into account when developing both the web and the mobile versions because users have to be able to easily navigate them. The next important thing is to find a way to scale large amounts of information to the screen size of the user’s gadget. Let’s not forget about guides and hints for the users. Of course, the investment company knows all about investments, and the developers also grow to learn a lot while working on the platform. But the end users may not have the necessary expertise and lack knowledge about the meaning of certain fields or forms. What’s important here is to keep the balance between giving enough advice and overloading the interface with pop-up windows and notifications. Build an investment website or app you would enjoy using. A multi-language website or app may cause you trouble too. In our case, it was English and German. We didn’t know German and asked for English content. As a result, we had some layout hiccups due to German words containing more letters than the English ones. After the seven crucial elements of an investment platform, here come seven pieces of advice for smoother investment platform development. To build a wealth management platform, hire developers that understand the domain of investments. It will be better and more efficient for further development, if the data you provide to the developers is written down in formulas with very specific examples. Requirements written down not only in professional but in simple language will make it easier and quicker for the team to understand what should be done. It is convenient when your client provides the most simple and logical formulas and algorithms to calculate investor reliability coefficients depending on their portfolio. Same goes for calculating customer risks – time of deposit, primary investments, and so on. The client should keep in mind that the developers aren’t investment experts, and it’s crucial to find a fitting communication channel such as Skype calls, specification by example, etc. If you already created code basics, have your developers check if it suits the general service architecture. It may be difficult to write over it and fix code compatibility problems. Every case is unique and sometimes it’s better if the code is written from scratch, even if basic developments have already been made. Everyone has to be on the same page about everything, especially when it comes to vocabulary. A great way to avoid mix-ups is to compile a dictionary where every term is explained. Some companies conduct workshops for the whole developer team or just the newbies, and explain the business logic and the function set of their service. Don’t hold back on testing costs. In our case, the most important is to test all the formulas that calculate investment risks, distribute the portfolio, etc. Sometimes it happens that a formula that works perfectly on paper or Excel wouldn’t perform as good in code. Testing may cost you time and resources, consequently more money, but getting a code that works flawlessly will be more than worth your while. This seems to be it. Many things we’ve noted here may seem too obvious, but it’s never a bad thing to be on the safe side. Investments are quite a complicated matter after all, and creating an online investment platform is a very demanding job to do. You should always remind your team about the most important things: Who are your customers? What do they expect? How do we get there? We hope that we could prepare you for what’s coming and help you provide a certain structure to what you already knew, but most importantly, make a time-consuming and intensive development process simpler and more transparent.